You are here: Home / News and Giveaways / Easy, Whole Wheat Einkorn Cheddar Crackers + Giveaway! Easy, Whole Wheat Einkorn Cheddar Crackers + Giveaway! This post is sponsored by Mighty Nest: An online store that provides you the ability to research, get advice and buy natural, organic and non-toxic products all in one place… plus they donate 15% of your order to your local school! As I’ve been sharing on the blog lately, my family is in the midst of baseball season. I’ve been intentional in making quick and easy meals for the busy baseball season and I’ve been trying to cut down on sugary treats that spread like wild fire at the ball park. Like I mentioned on facebook, although I’m being more intentional with the snacks and treats my children munch on during the season, I do not restrict what they choose to eat when other members of their team bring in snacks on their assigned day. It’s certain that during this time of the year they are eating more processed foods than they are used to so I make sure that they are daily consuming good probiotics like homemade milk kefir, kombucha, pickles, and beets. Throughout the year, our snacks consist of fruit and cheese; however, during this time of the year when we’re headed to many baseball practices and games, I’ve started making some small finger treats that Little Mama can munch on while watching her big brothers play ball. Mighty Nest was kind enough to send us a variety of picnic items perfect for the baseball season and summer ahead. We’ve been especially enjoying the light and easy-to-carry bright stripes picnic blanket. It’s so light that even a toddler can carry it. 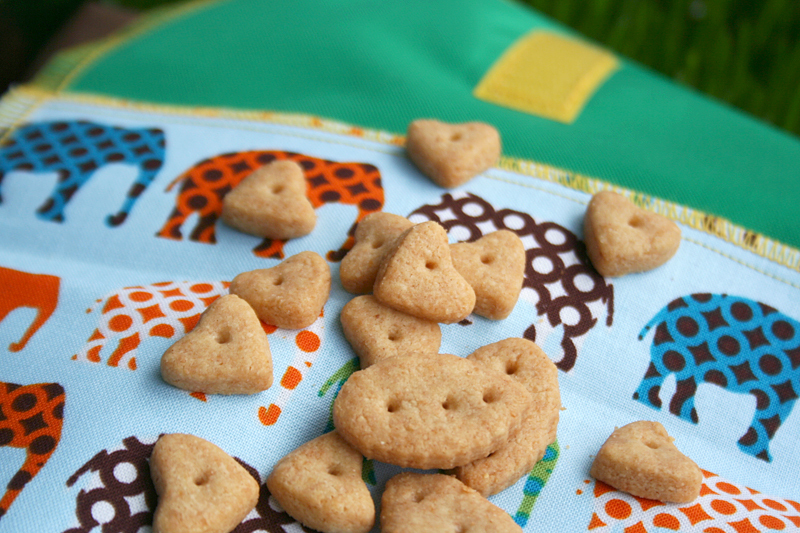 One of my favorite treats to make for the kids are 100% whole wheat einkorn cheddar crackers. They taste just like the ever so popular gold fish crackers or cheddar bunnies and my favorite thing about them is that they are incredibly easy to make. No joke… seriously easy! Once cut, they just need to be baked at 350F for 12-15 minutes. That’s it. Packed away in this air tight and reusable stainless steel tin from Mighty Nest, they’ll keep for a good week or so (if they last that long). They look like little cookies simply because I don’t use an orange colored cheese; instead, for my whole wheat cheddar crackers I use a sharp grass-fed cheddar that I buy at Trader Joes. The grass-fed cheese coupled with the einkorn flour make these whole wheat cheddar crackers little morsels of nourishment. Just be aware, the kids will devour these crackers so you might want to make a double batch. I enjoy to separate some of them out in these reusable snack/sandwich bags from Mighty Nest. I love that they’re machine washable and lined with a coated nylon that makes them easy enough to wipe clean with a damp sponge or cloth. Since Mighty Nest takes great care to ensure that the products they carry are toxin free, it’s great to know that these reusable snack/sandwich bags are BPA, PVC, Lead and Phthalate Free. Combine all the ingredients in a food processor, running the machine until the dough forms a ball; 1-2 minutes. Empty the contents of the food processor onto a lightly floured surface. Roll the dough out 1/8" thick. With a cookie cutter, dipping it in flour from time to time to ensure a clean cut, cut out the cracker shapes. Transfer the crackers to a parchment lined cookie sheet. Bake the crackers on the middle rack at 350F for 12 to 15 minutes, or until they are barely browned at the edges. Remove from the oven and transfer the parchment paper with crackers to a cooling rack to cool. 1. This recipe uses freshly ground einkorn wheat berries. If you'll be substituting with whole wheat flour, reduce the amount of flour to 3/4 cup. 2. Also, to speed up the process, roll out the dough into a square and cut out simple square crackers. Thank you Mighty Nest for the bright stripes picnic blanket, reusable snack/sandwich bags, stainless steel lunchbox, reusable bamboo utensil set, and Protect the Earth reusable napkin and hand towel. We’ll be sure to use them all summer long! Mighty Nest Picnic Pack Giveaway! Spring is the perfect time for a fresh new point of view. Pledge to try something new with me, like making your own treats for the kiddos and packing them in a reusable snack/sandwich bags. You can make your own or purchase them from Mighty Nest. It’s a small but mighty step in a healthier direction. To enter the giveaway to win the Picnic Pack pictured above worth $125 from MightyNest just click on the pledge button below. You’ll also earn points for your local school to help them win $1000 this month in the MightyNest for Schools “Get Fresh” Challenge. If you homeschool, no worries. Pledge for a local school near you. They’ll appreciate it. Just click the button that says “I Pledge” to enter! Have you ever made whole wheat cheddar crackers? Tell me, what are some of your favorite treats to make for your kids? Feel free to share any links and recipes in the comments below. This post is sponsored by Mighty Nest but of course, I only partner with companies that I fully endorse and believe in. All thoughts and opinions are my own. I made these today to take on vacation – it’s a good thing I doubled the batch! We plowed through half of them at lunch today! In case it’s helpful to others, I used 3/4 cup of Jovials pre-ground AP flour and the texture was very much like a cheese straw – light and airy with a nice crisp, which we loved. Next time, I’ll use a cup or maybe a little more to see if I can get a denser, more traditional cracker texture. Those look so delicious! I can’t wait to make them!!! Thanks so much for this great opportunity to help our school and win an awesome giveaway too! The crackers look great and I can’t wait to try them, but I was wondering about sprinkling some sea salt on them. Store bought goldfish crackers seem to be salted, aren’t they? Or am I imagining this? Judy, you can certainly sprinkle some sea salt on them but since they do have quite a bit of cheddar cheese in them that’s already salted, I don’t feel they need anymore. Awesome recipe! And it looks simple and so yummy! It will be perfect for all those summer outings! My son and I made these today 🙂 They truly are the easiest baked snacks ever! I think they were even easier to make than home made play dough, which my son loves. Thank you for this delicious recipe! I have not heard of that flour. What others can be substituted? I don’t know why I keep putting off making these! So easy! Can I use spelt at the same ratio as einkorn? Absolutely delicious! I ended up using spelt flour instead, thank you for including whole wheat measurements! I had to portion them out right away, because I know they would disappear quickly! Thank you so much for the recipe! No problem, Leanne! I’m glad you liked them 😀 I need to make another batch for next weeks ball games! The vera next day that Dena posted this on her FB, I had to try… It was absolutely delicious and oh! So easy to make! I made with the Eikorn flour( which I discovered thru Dena as well)…. Yummy!!!!! Do you have any recipes for crackers that aren’t cheese-based? We are dairy-free, but I love the idea of homemade crackers. I was looking for a simple einkorn cheddar recipe and yours popped up. I will be making these tonight and adding a lil apple cider vinegar to soak the flour before I roll and bake tomorrow. Woo hoo! Praying my lil guys adore them! Smile. They were very easy and good. I have never been able to make good crackers at home. I keep going to the store, seeing that not one has decent ingredients and coming back home. We all love them. I have haloumi cheese sitting at home, waiting to be used up. So, I used haloumi cheese and ghee instead of cheddar cheese and butter. Ghee, because it is easier to measure. I don’t have a food processor. So, I think ghee might have made it easier to form the dough. Also, while grating cheese, I used the bigger grating to speed it up and it worked just fine for the crackers. Thanks! I’m so glad I found your site! I’m already in love with it, so thankful for your humble spirit which pours out through every word and especially so impressed with your dedication of this blog to our Lord, Jesus Christ! I’ve been wanting to try homemade crackers and I’d like to try these but I’m not sure where to find the einkorn flour (in fact, I’ve never heard of it!) Can you tell me where you brought yours? And forgive me if you answered this question already, I looked through the comments and didn’t see my answer. Have a beautiful day! What if you left out the cheese and just used the butter and sea salt? How would you incorporate the amounts? My daughter does fine with butter but not so much cheese. I have not introduced wheat yet so I was going to try it first with just butter since I know she tolerates that. I plan on making this soon. I think I will add tumeric for color as well as nettles in my batch.